In recent years, programmatic has grown to become a popular media-buying channel for advertisers across the globe. As the mobile industry grows, it’s not difficult to see why app marketers are looking to programmatic media as the solution. Mobile users have diversified interests and behavior, making it much more difficult for app advertisers using traditional ways to select, negotiate, and buy the media that will optimize ad performance toward the target users. Programmatic media effectively speeds up the process by eliminating the negotiation between the buyers (advertisers) and sellers (publishers, saving both time and money. This allows app advertisers to set up rules for real-time bidding in a way that ensures the ad will reach the target users. Not only is automated media buying saving app advertisers a lot of time, but it is also cost effective. All an app advertiser has to do is bid on the desired media inventory at the desired cost per mille (CPM). Typically, if that CPM is above the minimum price seller have set and is highest amongst than other bidders, the app advertiser will win the auction. In a programmatic environment, there are two different level of price floors sellers can set: hard and soft price floors. Sellers could set a minimum price, also known as hard floor, in which they can tolerate for their media inventory in the ad exchanges. Bids that are below this minimum price are simply discarded. This means sellers will not take any bids less than the hard price floor, not even a cent less than the hard floor price. Soft floor, on the other hand, is more of a threshold that sellers can set to capture what would otherwise be missed opportunities, especially when all buyers set bids that are only slightly less than the floor. If the highest bid is less than the hard price floor, then there is no deal. This means that sellers will not be selling their media inventory at the bid price. If the highest bid is greater than the hard price floor but less than the soft price floor, the first-price auction takes place. Typically in this scenario, the winners pay the exact amount of the price they’ve bid. If the highest bid is greater than the soft floor, the second-price auction takes place. The highest bidder wins the first slot. The second-highest bidder wins the second slot. Third-highest bidder wins the third slot and so on. 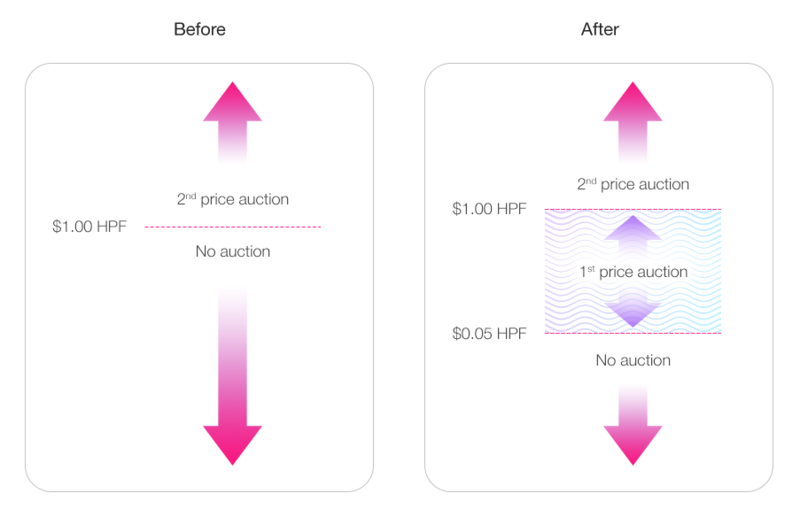 However, with the second price auction, the highest bidder pays the price bid by the second-highest bidder while the second-highest bidder pays the price bid by the third-highest bidder. To bid optimally, buyers should find a way to detect hard and soft price floors and adjust bidding strategies accordingly. Machine learning algorithm can be utilized to predict hard price floor to avoid ineffective bidding. At the same time, the algorithm can be used to predict soft price floor to avoid overpaying for the media inventory. If buyers can predict the hard price floor, they can adjust bid accordingly to make sure that the bid is not under the hard price floor. This way, they will not lose out on any impressions. On the other hand, if the buyers know the soft price floor, they can adjust the bid accordingly to make sure they do not exceed the soft price floor and enter in second-price auction. To learn more about programmatic media buying floor prices and how Aarki bid on media inventory, please contact us at contact@aarki.com.